I had a box of Quinoa sitting on my counter for a looong time. Everytime I felt the "guts" to get it over with, I'd chicken out. Takes too long, its weird, its too different, its "healthy super nut food". ok. (lol) So today, the Lord gave me the guts, the time, and the willpower to cook and try it. 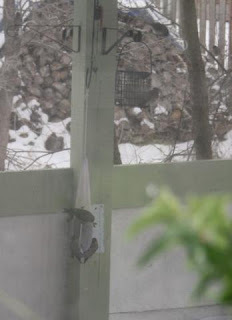 this is today, from my kitchen window, these birdies were NOT getting THIS bird food! I used to think that I didn't care to try new stuff. Looking back on all the weird and new and different foods I've tried in the past 5 years or so, I'm starting to rethink my self-observation! From Sushi (including the raw fish, and the veggie one), to brown rice, to tillapia (which I oh YUCK! red lobster, gotta get fresh fish guys really!) 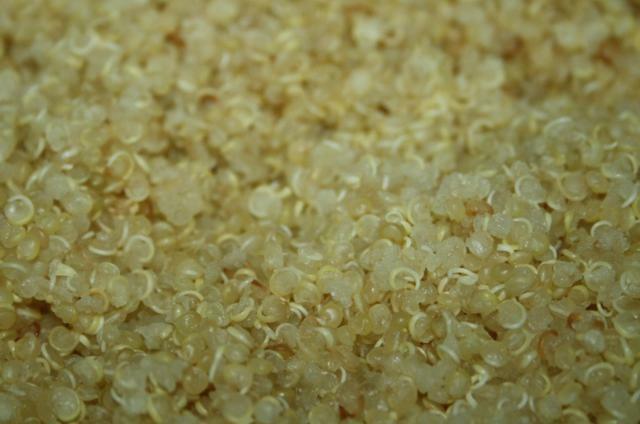 and on to Quinoa. Cooking with my wok has opened so many doors, and now that I have to eat healthier and in smaller but more frequent portions, this is leading to a new road to discovery! I want seconds, but sadly, I'm FULL! (giggle). I'm definitely going to keep experimenting with this. If you want to try out the recipe, check it out here. Rice cooker baby! :) All I did was follow the instructions on the box. PERFECTION! I dunno... this looks... obscene for some reason. This way (plain) its very bland. Me and my garlic! (and shrooms! :) I stir fried it quickly, and did not overcook it. It was good. YUM! This little amount made for 2 meals! Steak, shrooms, red onions, quinoa, and carrots. oh, and Garlic! I was STUFFED! So here's what I did. I call this Quinoa on the seat of the pants. 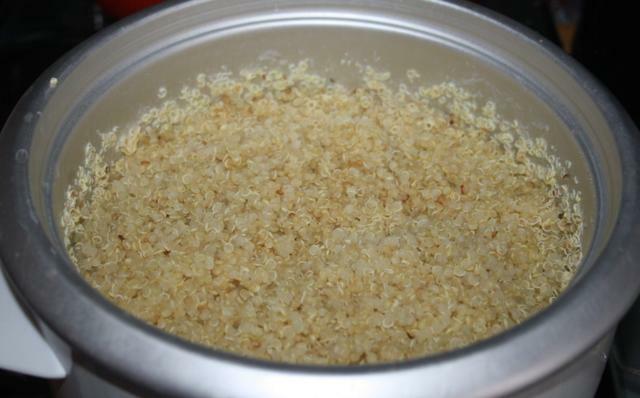 I put a box of quinoa (250g) in my rice cooker bowl, rinsed it (I wasn't sure if I should or not, apparently, if you don't it can be bitter - better safe than sorry). Then I added 2 cups of water, and let the rice cooker work its magic. The aroma in the house was strange and new, and rather nice. Kinda like a woodsy nutty mushroomy smell. Then again, maybe I'm just loosing it. While that was cooking, I sauted mushrooms with garlic, salt and pepper in a pan. When then quinoa was cooked, I laid super thin raw fresh red onion slices on top, put the Rice cooker cover back on, and went back to work. I pan fried a steak, with butter and garlic, salt and pepper. Put it aside. 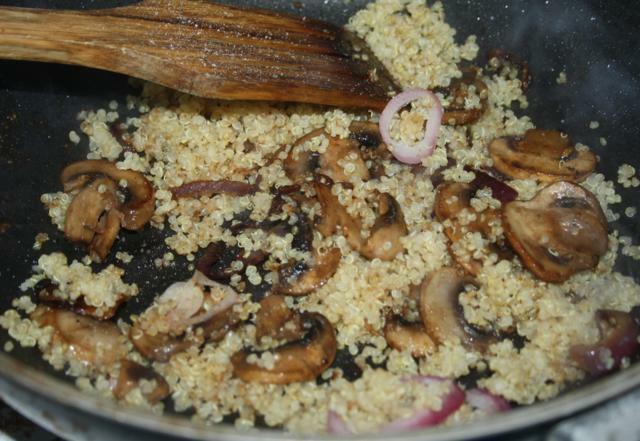 Now, I tried the quinoa at this point and was like, ohmygosh this is ewe! (lol!) Then I tried it again, and was like, oh, ok, it needs seasonings! DUH! of COURSE! plain rice is boring. plain pasta is boring! noooooo problem! I put the heat down to medium, and quickly stir-fried the lot. I wasn't sure how long to cook it, as I'd never done that before, but I stir-fried until some of the quinoa appeared toasted kind-of. 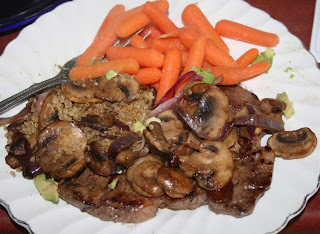 Then I put half of that in my plate, along with 1.5 cups of carrots, steak, and another generous round of shrooms (I got a pile of them on special... :) and oh MAN! was it good! I noticed that the juices of the steak blended with the quinoa, and I'd cut up an avocado (but it wasn't all ripe - yeeeesh!) but the little bits that were, made it taste even better (see the post below of mixing rice with avocado). If you've not tried this "superfood" try it, its light, different, fluffy, healthy, awesome! Hmmmm... what to cook, and what to eat! Not your average egg salad!